Kaiser-Permanente made a video about my deep brain stimulation for their Care Stories web page. 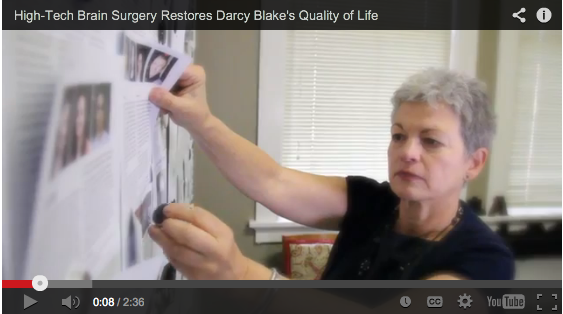 October 8, 2014 | by Darcy Blake | Kaiser Permanente made a video about my Deep Brain Stimulation for their Care Stories web page titled High-Tech Brain Surgery Restores Darcy Blake’s Quality of Life. In it, there’s a presentation by my talented neurosurgeon, Dr. Mark Sendrak who did the most stellar job on my DBS surgery last summer. There’s an excerpt of the video I made for the Neuro Film Festival titled Before and After DBS. The video ends with a travelogue of my trip to Sicily last summer. In short, a full package on the glorious results of successful DBS surgery for Parkinson’s Disease. I’m eternally grateful for the first rate care I received at Kaiser Permanente! You were already a star, now you are a superstar! Thank you for all you do for the PD community. Ditto on Barb and Cindy’s comments. You are an amazing role model. Loved the video and the pics from Italy! ← Are You a Couch-Cat or Mover at the Moving Day® Walk?